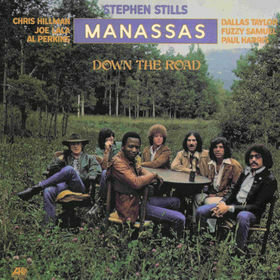 Manassas was a short-lived rock band active in the early 70s, led by Stephen Stills. The success of Manassas' debut album led to a busy global touring schedule throughout most of 1972. On returning to the US, they began work on the follow-up (after Chris Hillman was briefly distracted by a reunion album with The Byrds). Expectations were high, and when Down The Road was released in 1973 it was coolly received by critics, and sales were not as good as the band would have wanted. Nevertheless it was still a solid album, with a diverse rock sound throughout (including moments of country and latin-flavoured material), highlighted by some fantastic instrumentation. It also featured guest contributions from guitarist Joe Walsh and keyboardist Bobby Whitlock. However the band's days were numbered. During the hiatus taken after the album's release, Chris Hillman formed a new group with Richie Furay and J.D Souther, and bandleader Stephen Stills was lured back to an attmpted reunion of Crosby, Stills, Nash & Young (though their attempts to record a new album together went nowhere). On returning to regroup Manassas, he found that drummer Dallas Taylor had developed a worrying heroin addiction, and bassist Fuzzy Samuels had left. He replaced Samuels with Kenny Passarelli, and called up Johnny Barbata to help out should Taylor let them down. After another tour, the band's breakup was officially announced. It was during the band's last gig that they were joined on stage by David Crosby, Graham Nash and Neil Young. The CSNY reunion was still very much happening, and the foursome did go on tour in 1974. Hillman went on to release two albums with The Souther-Hillman-Furay Band, joined by Manassas members Al Perkins and Paul Harris.